Joe Henderson (April 24, 1937 – June 30, 2001) was an American jazz tenor saxophonist. In a career spanning more than forty years Henderson played with many of the leading American players of his day and recorded for several prominent labels, including Blue Note. From a very large family with five sisters and nine brothers, Henderson was born in Lima, Ohio, and was encouraged by his parents Dennis and Irene (nee Farley) and older brother James T. to study music. He dedicated his first album to them "for being so understanding and tolerant" during his formative years. Early musical interests included drums, piano, saxophone and composition. According to Kenny Dorham, two local piano teachers who went to school with Henderson's brothers and sisters, Richard Patterson and Don Hurless, gave him a knowledge of the piano. He was particularly enamored of his brother's record collection. It seems that a hometown drummer, John Jarette, advised Henderson to listen to musicians like Lester Young, Stan Getz, Dexter Gordon and Charlie Parker. He also liked Flip Phillips, Lee Konitz and the Jazz at the Philharmonic recordings. However, Parker became his greatest inspiration. His first approach to the saxophone was under the tutelage of Herbert Murphy in high school. In this period of time, he wrote several scores for the school band and rock groups. By eighteen, Henderson was active on the Detroit jazz scene of the mid-1950s, playing in jam sessions with visiting New York stars. While attending classes of flute and bass at Wayne State University, he further developed his saxophone and compositional skills under the guidance of renowned teacher Larry Teal at the Teal School of Music. In late 1959, he formed his first group. By the time he arrived at Wayne State University, he had transcribed and memorized so many Lester Young solos that his professors believed he had perfect pitch. Classmates Yusef Lateef, Barry Harris and Donald Byrd undoubtedly provided additional inspiration. He also studied music at Kentucky State College. Shortly prior to his army induction in 1960, Henderson was commissioned by UNAC to write some arrangements for the suite "Swings and Strings", which was later performed by a ten-member orchestra and the local dance band of Jimmy Wilkins. Henderson spent two years (1960–62) in the U.S. Army: first in Fort Benning, where he even competed in the army talent show and won first place, then in Fort Belvoir, where he was chosen for a world tour, with a show to entertain soldiers. While in Paris, he met Kenny Drew and Kenny Clarke. Then he was sent to Maryland to conclude his draft. In 1962, he was finally discharged and promptly moved to New York. He first met trumpeter Kenny Dorham, an invaluable guidance for him, at saxophonist Junior Cook's place. That very evening, they went see Dexter Gordon playing at Birdland. Henderson was asked by Gordon himself to play something with his rhythm section; needless to say, he happily accepted. Although Henderson's earliest recordings were marked by a strong hard-bop influence, his playing encompassed not only the bebop tradition, but R&B, Latin and avant-garde as well. He soon joined Horace Silver's band and provided a seminal solo on the jukebox hit "Song for My Father". After leaving Silver's band in 1966, Henderson resumed freelancing and also co-led a big band with Dorham. His arrangements for the band went unrecorded until the release of Joe Henderson Big Band (Verve) in 1996. From 1963 to 1968, Henderson appeared on nearly thirty albums for The Sidewinder and "out" albums with pianist Andrew Hill (Black Fire 1963 and Point of Departure, 1964) and drummer Pete La Roca (Basra, 1965). In 1967, there was a brief association with Miles Davis's quintet featuring Hancock, Wayne Shorter, Ron Carter and Tony Williams, although the band was never recorded. Henderson's adaptability and eclecticism would become even more apparent in the years to follow. Signing with Orrin Keepnews's fledgling Milestone label in 1967 marked a new phase in Henderson's career. He co-led the Jazz Communicators with Freddie Hubbard from 1967 to 1968. Henderson was also featured on Hancock's Fat Albert Rotunda for Warner Bros. It was during this time that Henderson began to experiment with jazz-funk fusion, studio overdubbing, and other electronic effects. Song and album titles such as Power to the People, In Pursuit of Blackness, and Black Narcissus reflected his growing political awareness and social consciousness, although the last album was named after the Powell and Pressburger film of 1947. After a brief association with Blood, Sweat & Tears in 1971, Henderson moved to San Francisco and added teaching to his résumé. 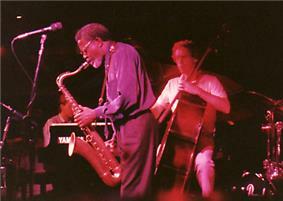 Though he occasionally worked with Echoes of an Era, the Griffith Park Band and Chick Corea, Henderson remained primarily a leader throughout the 1980s. An accomplished and prolific composer, he began to focus more on reinterpreting standards and his own earlier compositions. Blue Note attempted to position the artist at the forefront of a resurgent jazz scene in 1986 with the release of the two-volume State of the Tenor recorded at the Village Vanguard in New York City. The albums (with Ron Carter on bass and Al Foster on drums) revisited the tenor trio form used by Sonny Rollins in 1957 on his own live Vanguard albums for the same label. Henderson established his basic repertoire for the next seven or eight years, with Thelonious Monk's "Ask Me Now" becoming a signature ballad feature. It was only after the release of An Evening with Joe Henderson, a live trio set (featuring Porgy and Bess. On June 30, 2001, Joe Henderson died in San Francisco, California, as a result of heart failure after a long battle with emphysema. ^ Mel Martin, Interview with Joe Henderson, in The Saxophone Journal, March/April 1991. Retrieved April 24, 2007. ^ Scott Yanow, Allmusic Biography Retrieved June 25, 2009. Javier Arau. "Joe Henderson "Lush Life" solo: Transcription and analysis". Retrieved 2015-09-17. "You've Made Me So Very Happy"